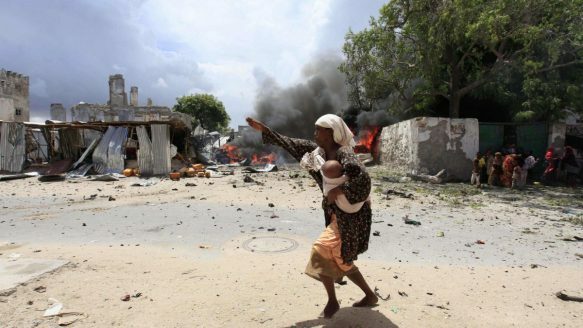 FEISAL OMAR / REUTERS- A Somali woman runs to safety near the scene of a blast in Mogadishu April 14, 2013. Two car bombs exploded outside the law courts and gunmen stormed the building. Dhore’s cousin told the Star in a November 2009 interview that the 25-year-old had left his Markham home with his aunt to visit an ailing grandmother in Nairobi, but then disappeared while in Kenya. The cousin said she was baffled, saying “there had been nothing in his behaviour that would have worried us.”Dhore had been studying math and history at York University but decided to take a break just before he left Canada, his relatives said. A friend of his family said he contacted his sister in the years since, telling her he had gotten married, had children and was living in Somalia.